About 11 years ago I decided to dedicate myself to bobbinlacemaking and teaching. Nowadays I have 5 groups of students. They come to my house every 2 weeks to follow the lesson. The groupsize varies from 2 (minimum) to 5 (absolute maximum) students per session. Every student works on his or her own level and in her own speed. True starters start with the Explore course. In this course they get aquainted with the basic stitches and a few lace types. After this they van decide what they want to do. Amoung my students are a few artists, who want to use the lace in their work. Sometimes these students decide very soon what kind of lace they want to make or let it depend whatever they need for their work. I accept their decisions and follow them on their way with support and advice. I try to give regularly courses on art schools as the Royal Academy of Art in The Hague. 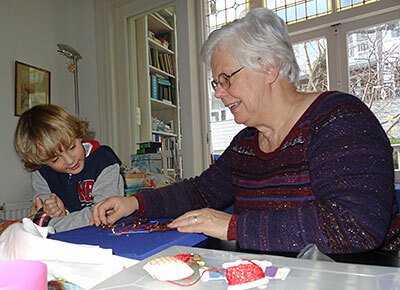 Here I gave the last 3 years each year a short course to students in their first or second year to give them an oportunity to get aquainted with bobbin lace, so that they can use it in their pieces during their education or lateron in their work. I started making bobbin lace quite young as result of having a mother and a grandmother who made lace theirselves. Very young I sat beside my mother imitating the stitches she made with my crayons. When she could buy a pillow and bobbins from a friend, she did not hesitate a moment to do so and give me my own pillow and bobbins for my 13th birthday. She taught me playing w9ith the bobbins, threads and pins. This game still fascinates me; the restfulness of the ritmic movements of the bobbins, the dynamic and the stress of designing or reconstruct old laces and the final result of this all: the lace.